The Mughal Emperor Aurangzeb built the Badshahi Mosque (Urdu: بادشاھی مسجد), or the 'Emperor's Mosque', in 1673 in Lahore, Pakistan. The mosque displays an excellent example of Mughal era architecture. The second largest mosque in Pakistan, after the Faisal Mosque in Islamabad, the sanctuary accommodates over 55,000 worshipers. Jama Masjid in Delhi, India, closely resembles the architecture and design of the Badshahi Masjid. 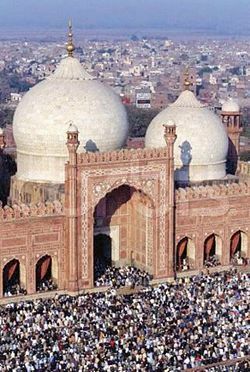 Badshahi Masjid is one of the locations where Qari' Abdul Basit recited the Qur'an. The Badshahi Mosque in Lahore, completed in 1673, had been designed and constructed as the compliment to Lahore Fort. Lahore Fort had been rebuilt over a century earlier, in 1566, by Mughal emperor Akbar. The symbolism of building the aesthetically pleasing Badshahi Mosque across from the formidable Lahore Fort gave the combined impression of beauty and grace with strength and power. That combination captures the gist of Mughal architecture. The Mughals introduced to Indian architecture that has come to symbolize the beauty and mystique of Indian civilization. Since Pakistan split from India in 1947, Pakistan has uplifted the Badshahi Mosque and Fort Lahore as symbols of the nation. The size of Badshahi Mosque is difficult to comprehend. It may have been the largest building in the world during the seventeenth century. Fifty-five-thousand worshipers could gather together for prayers in the mosque. That is the equivalent to many sports stadiums. 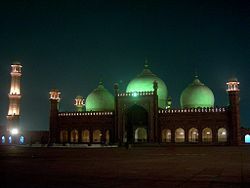 The Badshahi Mosque displays the immense power and spirituality of Islam, like Hagia Sophia in Constantinople during the sixth to fifteenth centuries did for Eastern Orthodox Christianity. Built under the patronage of the sixth Mughal Emperor, Aurangzeb Alamgir, the mosque came to completion in 1673. Aurangzeb's foster brother Muzaffar Hussain (also known as Fidaie Khan Koka), governor of Lahore 1671 to 1675, supervised the building. He also served as Master of Ordnance to the emperor. The construction of the mosque took about two years from May 1671 to April 1673. Built opposite the Lahore Fort, a position that illustrated its importance in the Mughal Empire, Badshahi Mosque took an honored place in the empire. In conjunction with the building of Badshahi, the Emperor had a new gate built at the fort named Alamgiri Gate. Badshahi Mosque had badly damaged and misused during Sikh Rule. When the Sikhs ruled Lahore, they used the mosque for horse stables for the many horses, camels, and other animals that they used. They also would steal the jewels from the mosque, such as marble, rubies, gold, and other valuables. Sikhs forbade Muslims from entering the mosque to worship, the government granting only a small place outside the mosque where they could worship. Even when the British took control of India, they used the mosque for military training including rifle and cannon fire range. Sensing Muslim hate for them, the British demolished a large portion of the wall of the mosque, rendering the mosque unusable as a rallying place for anti-British planning. The British later returned the mosque to Muslims as a good will gesture, even though the structure had become dilapidated from misuse and neglect. The Badshahi Mosque Authority restored the holy place to its original glory. The Badshahi Mosque Authority supervised only piecemeal repairs beginning in 1852. The Authority carried out extensive repairs from 1939 to 1960, costing 4.8 million rupees. Those repairs brought the mosque back to its original shape and condition. The architect Nawab Zen Yar Jang Bahadur prepared the blueprint for the repairs. On the occasion of the second Islamic Summit held at Lahore on February 22, 1974, thirty-nine heads of Muslim states offered their Friday prayers in the Badshahi Masjid, led by Maulana Abdul Qadir Azad, the 'Khatib' of the mosque. In 2000, Saleem Anjum Qureshi supervised the repair work of marble inlay in the main vault. Recently a small museum, containing relics of Muhammad, his cousin Hazrat Ali Razi allah Anho, and his daughter, Hazrat Fatima ZahraHazi allah anha, had been added to the mosque complex. In an effort to mirror the character of its founder, architects designed the mosque to exude boldness, vastness and majesty. The mosque had been largest in the world at the time of its building. The interior has rich embellishment in stucco tracery (Manbatkari) and panelling with a fresco touch, all in bold relief, as well as marble inlay. Stone carving, as well as marble inlay on red sandstone, specially of loti form motifs in bold relief, decorates the exterior. Embellishments on the mosque display Indo-Greek, Central Asian and Indian architectural influence in technique and motifs. Beautiful ornamental merlons, inlaid with marble lining, add grace to the perimeter of the mosque and beautify the skyline. In various architectural features, such as the vast square courtyard, the side aisles (dalans), the four corner minars, the projecting central transept of the prayer chamber, and the grand entrance gate, the history of development of mosque architecture of the Muslim world over the thousand years prior to its construction in 1673 culminates. The north enclosure wall of the mosque had been laid close to the Ravi River bank, denying the building of a majestic gateway on that side. To ensure the symmetry of the gate, no majestic gate could be built on the south side, too. Thus a four aiwan plan, like the earlier Delhi Jamia Masjid, had to be abandoned. The walls had been built with small kiln-burnt bricks laid in kankar, lime mortar (a kind of hydraulic lime) but have a veneer of red sandstone. The steps leading to the prayer chamber and its plinth have been constructed with variegated marble. The prayer chamber, exceptionally deep, divides into seven compartments by rich engraved arches carried on enormously heavy piers. Out of the seven compartments, three double domes finished in marble have artistically superb curvature, while the rest have curvilinear domes with a central rib in their interior and flat roof above. In the eastern front aisle, the ceiling of the compartment runs flat (Qalamdani) with a curved border (ghalatan) at the cornice level. The original floor of the courtyard had been laid with small kiln-burnt bricks set in the Mussalah pattern. The present red sandstone flooring had been laid during the last extensive repairs from 1939 to 1960). Similarly, the original floor of the prayer chamber had been constructed using cut and dressed bricks with marble and Sang-i-Abri lining, forming Mussalah. During the most recent repairs, they had been replaced by marble Mussalah. Courtyard: 528'-8" x 528'-4" (Area: 278,784 ft2), divided into two levels: the upper and the lower. In the latter, funeral prayers can also be offered. Central Dome: Diameter 65' at bottom (at bulging 70'-6"); height 49'; pinnacle 24 ft and neck 15 ft high. Side Domes: Diameter 51'-6" (at bulging 54'-2"); height 32 ft; pinnacle 19 ft; neck 9'-6" high. Side aisles (Dalans): 80 in number. Height above floor 23'-9"; plinth 2'-7." Chaghtai, Muhammad Abdulla. 1972. The Badshahi Masjid (built by Aurangzeb in 1084/1674): history and architecture. Lahore: Kitab Khana-i-Nauras. OCLC 69381784. Khan, Ahmad Nabi. 1991. Development of mosque architecture in Pakistan. Islamabad, Pakistan: Lok Virsa Pub. House. ISBN 9789694680088. Nadiem, Ihsan H. 1998. Historic mosques of Lahore. Lahore: Sang-e-Meel Publications. ISBN 9789693509403. 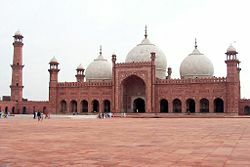 Pictures and information about Badshahi Masjid. Satellite image of Badshahi Mosque from Google Maps. This page was last modified on 6 May 2016, at 20:39.